This night out in Kyoto will give you a true traditional Japanese evening, allowing you to experience all the aspects of life in the city. From JR Kyoto Bus Terminal, you will first head to Shozan Resort right in Kyoto to enjoy one of the highest forms of Japanese entertainment: a traditional Japanese dance from one of Kyoto's esteemed and prized Maiko. Maiko are apprentice geiko, highly trained in the arts of traditional Japanese dance and music, and considered the highest level of entertainer in Japan. 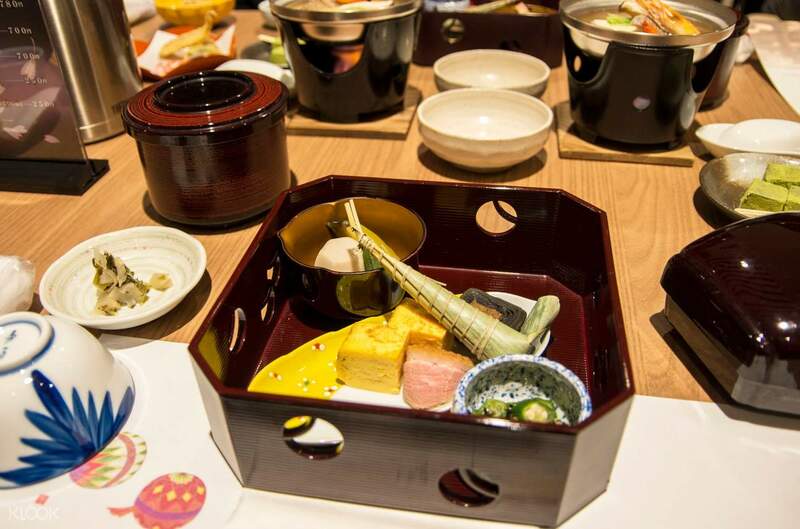 Here, you will also enjoy a traditional kaiseki dinner, a multi-course traditional Japanese dinner that requires great skill to craft and produce. 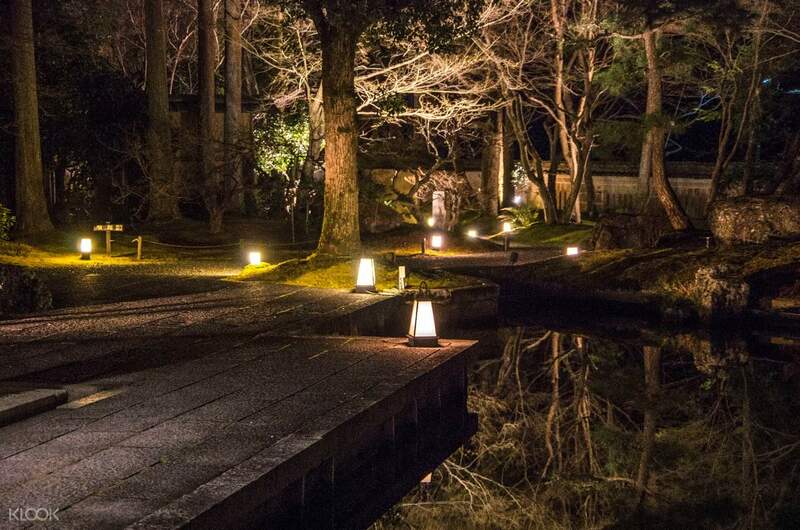 You'll be able to enjoy the Shozan Resort's traditional Japanese garden as well, a beautifully tranquil location where you can spend some free time. Then you'll meet up with others and head to Higashiyama Sanjo Park where you'll see a spectacular nighttime view of the mountain, while the city glitters in the evening. As you head back to the station at the end of the tour, you'll look back at these priceless memories of a wonderful evening in Kyoto. Unique experience to see maiko performance and taste kyoto kaiseki dinner. we had enough time for our dinner while enjoying 2 short dance with the maiko. the whole tour was conducted in Japanese hence we just enjoy our dinner and we were the only tourist couple in the grp, most of them were elderly Japanese. 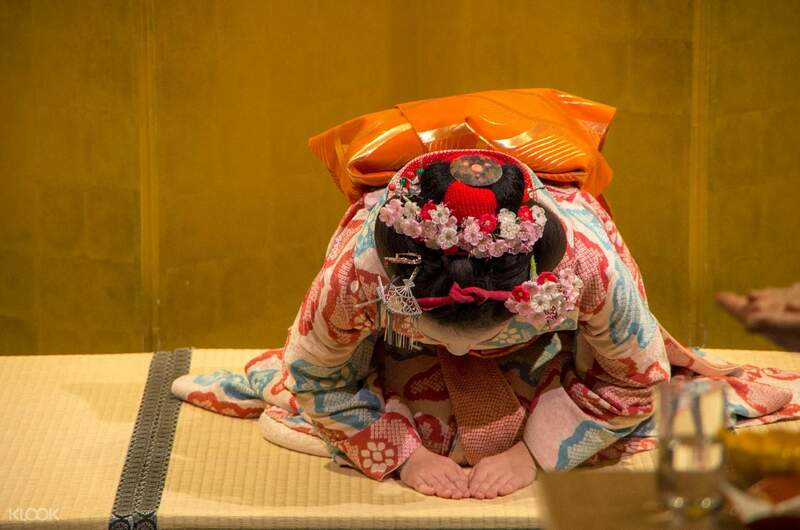 Unique experience to see maiko performance and taste kyoto kaiseki dinner. we had enough time for our dinner while enjoying 2 short dance with the maiko. the whole tour was conducted in Japanese hence we just enjoy our dinner and we were the only tourist couple in the grp, most of them were elderly Japanese. Book this tour package if it is available. It's the best value for money you will get if you want to see an actual Maiko and eat a Kaiseki Dinner. It starts with a bus tour of a few areas of interest in Kyoto before taking you to tje Shozam Resort for the dinner and show. Dinner was a feast for all senses and the Maiko will make you feel that you've been transported to another world. Enjoy a panoramic view of Kyoto's city lights to cap your evening. Book this tour package if it is available. 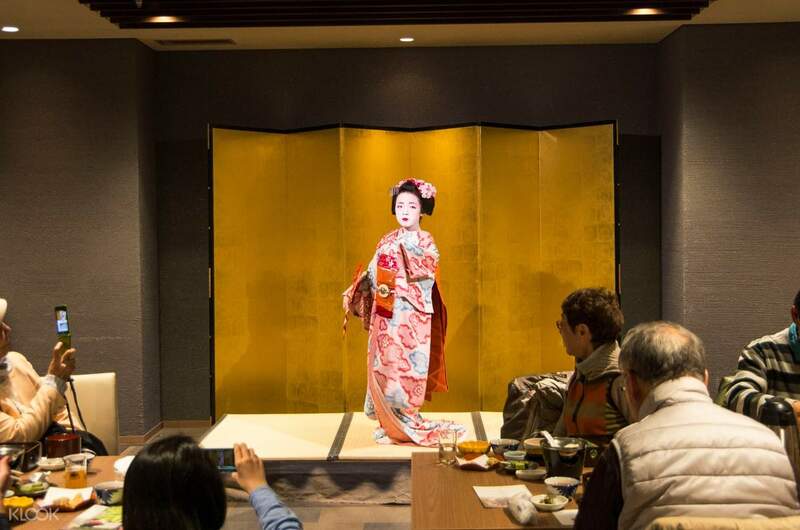 It's the best value for money you will get if you want to see an actual Maiko and eat a Kaiseki Dinner. It starts with a bus tour of a few areas of interest in Kyoto before taking you to tje Shozam Resort for the dinner and show. Dinner was a feast for all senses and the Maiko will make you feel that you've been transported to another world. Enjoy a panoramic view of Kyoto's city lights to cap your evening. The food spread was really interesting. It was helpful that they had a menu card in English. The meiko dance and photo taking was nice. Night view of the city from higher ground was awesome. Overall, experience would have been better if they had started earlier, say about 1630. The sights pointed out during the bus ride was pointless as it was dark. The food spread was really interesting. It was helpful that they had a menu card in English. The meiko dance and photo taking was nice. Night view of the city from higher ground was awesome. Overall, experience would have been better if they had started earlier, say about 1630. The sights pointed out during the bus ride was pointless as it was dark. Nice experience and have an amazing night with good dinner on 7th March, 2019. Must go when you are in Kyoto. Thanks! Nice experience and have an amazing night with good dinner on 7th March, 2019. Must go when you are in Kyoto. Thanks! The food was good. The most affordable trip to meet maiko. The food was good. The most affordable trip to meet maiko. The tour is operated by Keihan. Everything was in Japanese. Even though they had English/mandarin/Korean translations through a headset, because we could understand a smattering of Japanese, we realised what was being said live differs from what was translated. The food was so-so, but the performance and gorgeous views more than made up for it. The tour is operated by Keihan. Everything was in Japanese. Even though they had English/mandarin/Korean translations through a headset, because we could understand a smattering of Japanese, we realised what was being said live differs from what was translated. The food was so-so, but the performance and gorgeous views more than made up for it. bus station is easy to find from kyoto station tour guide can't speak English. the whole tour is in Japanese. they have an audio guide in English, Chinese and Korean to explain the attraction that the bus went past. unlimited photos with the maiko, she just sat there and u can take as many photo as u want. food is just so so nothing to wow. limited time for shozan garden, so we hang around at the entrance night view is so so too. nothing much cos not many high rise in the area. this is good for those with elderly and children. most of the tourist are elderly though. seat in the bus are all assigned. from my own research, this is worth the money cos for additional SGD30 it has dinner, bus, nightview. definitely a value for money maiko show compared to others. ended the tour around 830pm. bus station is easy to find from kyoto station tour guide can't speak English. the whole tour is in Japanese. they have an audio guide in English, Chinese and Korean to explain the attraction that the bus went past. unlimited photos with the maiko, she just sat there and u can take as many photo as u want. food is just so so nothing to wow. limited time for shozan garden, so we hang around at the entrance night view is so so too. nothing much cos not many high rise in the area. this is good for those with elderly and children. most of the tourist are elderly though. seat in the bus are all assigned. from my own research, this is worth the money cos for additional SGD30 it has dinner, bus, nightview. definitely a value for money maiko show compared to others. ended the tour around 830pm. maiko show is nice to enjoy, cause its not easy to see that. the dinner, is special. but not a lot. from the bus, its hard to see the sightseeing stuff. the lookout point over the city by night is cool, and the 10 minutes you get up there are more than enough. maiko show is nice to enjoy, cause its not easy to see that. the dinner, is special. but not a lot. from the bus, its hard to see the sightseeing stuff. the lookout point over the city by night is cool, and the 10 minutes you get up there are more than enough. Ok just to spend a night out. Kaiseiki dinner was not so great tasting, Maiko performed 2 dances, and there was ample time to take photos with her. Beautiful resort though, and ended with a good view of Kyoto at night. Guide was very enthusiastic though fully in Japanese. Ok just to spend a night out. Kaiseiki dinner was not so great tasting, Maiko performed 2 dances, and there was ample time to take photos with her. Beautiful resort though, and ended with a good view of Kyoto at night. Guide was very enthusiastic though fully in Japanese.